Message "Cannot display the folder. Microsoft Outlook cannot access the specified folder location. The operation failed. An object cannot be found." will be displayed when attempting to view a shared folder in Outlook. In Outlook, right-click on inbox and select Properties. 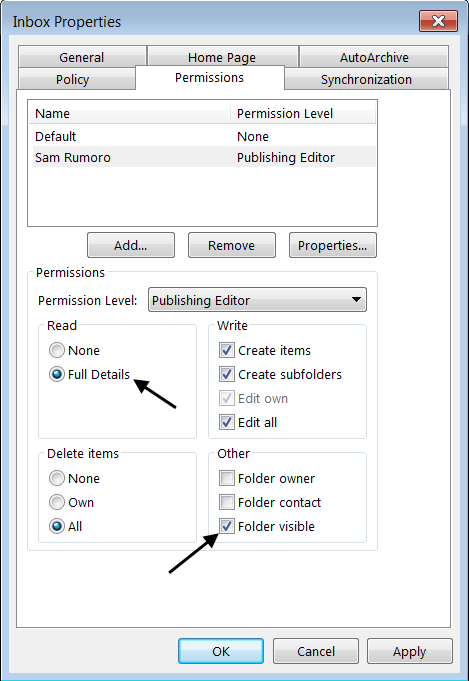 In the Properties dialog box, select the Permissions tab. Enter jane.doe@example.com, select Add, and select OK. Under Permission Level, select the desired permission level and select OK. Ensure that at least Full Details and Folder visible are selected. Next, John Doe would need to add Jane Doe's inbox. In Outlook, select File > Account Settings. Enter jane.doe@example.com and select OK.
Close Outlook and Skype / Lync. Select the Windows Start icon, type %LOCALAPPDATA%\Microsoft\Outlook\ in search, and press enter. This is one of the better and most clear answers I have found on this topic. Thanks for taking the time to post it. I am glad to know this was helpful.